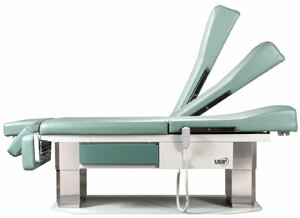 The 5005 from UMF is the only bariatric power treatment table to feature a 30" wide and 70" long UMF Vacuum Formed Comfort top. It's sleek vacuum formed seamless design allows for easy cleaning, while the thick high density pad with a built in pillow insures the ultimate patient comfort. Only the 5005 has a low position of 18" and the capacity to lift 600 lbs. The 5005 provides for infinite height postitioning from a low of 18" to a high 34" all in the industry's most comfortable and stable design. 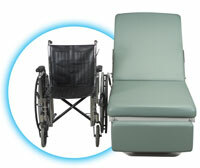 With the touch of a button, the 5005 Power Bariatric Treatment Table lowers to 18". 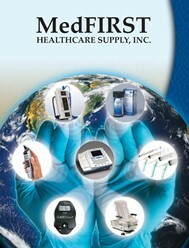 Patient accessiblity is effortless for wheelchair transfers, for elderly patients, or for patients with special needs. The 5005's fully articulating, power assisted back section with built-in pillow allows for simple, easy position changes while the fully articulating leg section provides added comfort and support for taller patients. Only the 5005 has a low position of 18" and the capacity to lift 600lbs. The 5005 provides for infinite height positioning from a low of 18" to a high of 34" - all in the industry's most comfortable and stable design. Concealed paper roll holder - accepts 18", 21" or 24"